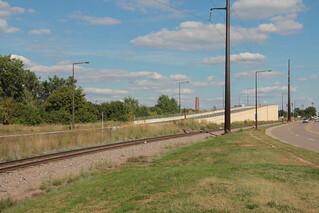 The University of Minnesota bus transitway rising to arc over the BNSF Railway (ex-Northern Pacific) tracks. Note the desire path along Energy Park where a sidewalk should be. The sidewalk gap is over 2300 feet (700 m) long.